Tensions heightened between Russia and the US after Washington signed a deal with Poland to position US missile interceptors on Polish soil, with Russia warning that this created mistrust and would fuel an arms race. US Secretary of State Condoleezza Rice said the war in Georgia had caused the US to "step back and look hard" at what Russia's ambitions were, but she insisted that there was no new Cold War. Despite the threat from Moscow that Poland was putting itself at risk of a Russian attack, Polish leaders were all smiles during the signing ceremony at the presidential palace in Warsaw, in the presence of Ms Rice. Polish President Lech Kaczynski played up the role that he and his allies in the previous government had in making the deal happen, adding that he was very satisfied that "one of the main strategic goals which he had set himself, had been realized". Donald Tusk, the prime minister and the president's political rival, had initially been sceptical about the deal and anxious to diminish tensions with Russia. His coming to power in November was seen as a reversal for the US plans to station their missile defence shield in Poland. But on Wednesday he declared it was "a very special moment in our common history... We have achieved the main goal. It means our countries, Poland and the United States will be more secure". The two leaders were in a way trying to take credit for the deal, as newly-released polls in Poland showed that for the first time a majority of Poles support the agreement. The country has been shaken by Russian threats against it and by the sight of Russian tanks on the streets of Georgian cities. The US says there is no connection between the situation in Georgia and the signing of the deal, with Ms Rice insisting that the deal was simply ready when it was ready. In an interview with the BBC she added there was no reason to delay the signing. But the lead US negotiator, John Rood, acknowledged that "obviously, there is a certain environment you are operating in. You can't deny it". In the last round of negotiations, he said both sides showed some flexibility. After 18 months of negotiations, described as tough but friendly by both the US and Poland, Washington eventually agreed to one of Poland's key demands on placing a battery of US Patriot missiles permanently on Polish soil. Poland feels this will help offset the Russian threats it is facing for agreeing to host the US missile defence shield. The US insists that the shield is not aimed at anyone, but is meant as protection for the US and Europe from the threat posed by rogue nations. Critics say that the Pentagon has still not proved that the system would work in realistic conditions. The Russian foreign ministry issued a statement saying that "the long-range interceptor missiles to be deployed in Poland do not have, and in the foreseeable future will not have, any target other than Russian intercontinental ballistic missiles". The statement continued: "It is clear to us - and the US leadership does not deny this - that the... US anti-missile defence in Europe will be broadened and modernised. "In this case Russia will be forced to react, and not only through diplomatic steps." Poles hope that this is all sabre-rattling but they also realise that more than ever before they are tied to the US. One commentator said that when his country joined Nato it married the US and now with the missile defence shield agreement, it had consummated the marriage. Will Russia reward Obama's missile defence shift? 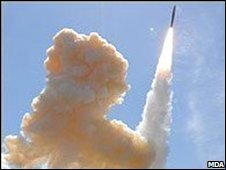 Is US right to cut missile plan?